How do I know if my property has a water meter? Important note for tenants: You must be the bill payer and have your landlord's permission. If you’re unsure whether we supply your water, please use our postcode checker on the right to find out. Do you have a payment reference? Is the property a house or a flat? If less than six months, do you have your landlord's permission for a meter? Do you pay your water bill directly to Southern Water? Do you use a sprinkler or unattended watering device? Where is your internal stop tap location? You need to locate your internal stoptap and make it accessible prior to the survey being carried out. 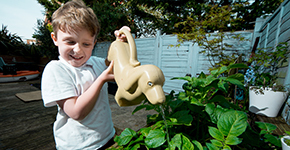 Do you share a water supply with your neighbours? Do you have a permanently installed water softener? I have read and understood my responsibilities on electrical earthing. I wish to apply for a water meter to be installed at my property in accordance with Southern Water's household metering procedures. By completing this form you are agreeing to have charges for the above premises based on the volume of water supplied.